Work at home mother of three shares tips on how to be successful online. 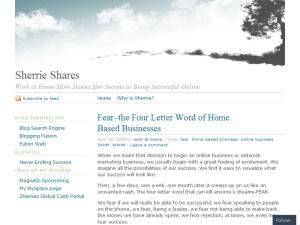 This what your Sherrie Shares Blog Ad will look like to visitors! Of course you will want to use keywords and ad targeting to get the most out of your ad campaign! So purchase an ad space today before there all gone! When we make that decision to begin an online business or network marketing business, we usually begin with a great feeling of excitement. We imagine all the possibilities of our success. We find it easy to visualize what our success will look like. Then, a few days, one week, one month later,it creeps up on us like an unwanted rash. The four letter word that can kill anyone’s dreams-FEAR. We fear if we will really be able to be successful, we fear speaking to people on the phone, we fear, being a leader, we fear not being able to make back the money we have already spent, we fear rejection, at times, we even may fear success. Where does this fear come from? Usually it stems from failures of the past. It is hard to forget what that failure feels like and each day it can become harder to overcome our fears and keep going. It is days like this that you must think like a child. Think of a small child learning to walk. How many times do they fall down, but continue, even at times with a little fear, to get back up and try, try, try again. Before long, they are experts, running fearless. You must push yourself to be like this small child. Overcome your fear, get up again and again and you will begin running fearless with success. In the rollercoaster world of online businesses, one can become very frustrated and feel like they are on a downslope at times. Sometimes things just don’t go right…leads aren’t coming in, people are buying your product, the last advertising you did was a bust…Well, we all know that this can be the case one day and be the the opposite the next. So how do you help yourself rise up from the down slopes? You celebrate your successes! When you make a sale, gain a new customer, have a surge of leads, someone calls you to show interest, you celebrate! How you celebrate is up to you, maybe you spend a little of the money on something nice for yourself. Maybe you treat yourself to a fancy dinner. Maybe you call someone and share. Maybe you dance in your kitchen. Or maybe you just take a long hot bath. Whatever, you do, it is important that you take note and celebrate each success in your business. Those bits of celebration are what get you through the rough times. It won’t be long, then, before you find your down slopes aren’t so steep and you are celebrating much more often. Are You One of the 84%? Just last week I happened to have the television on as I was folding some laundry. Oprah was on and had a guest, whose name I cannot recall at this time, who spoke of a startling statistic: 84% of people in this country are unhappy with their jobs. Eighty-four percent of us go to work every day to a job that does not satisfy us? How tragic. When you think about how much of one’s life one spends at work–that is a lot of time spent in unhappiness. I can empathize as I used to be one of those people. Almost two years ago, however, I made a decision to change my life because I wanted to be happier. I deserved it and my family deserved it…because as the saying goes, “If mama ain’t happy, ain’t nobody happy”. I am so glad that I did. I now work from home, make a great income, and am able to spend the time with my family that I only dreamt about two years ago. Now, I know that there are those that work from home that are still in that 84%. In fact, one of Oprah’s guests was one of them. If you are one, I invite you to just take a step back and look at what it is you are doing and why it is that you are not happy doing it. Then, make a change. I know I make it sound so simple, but sometimes it can be. Changes don’t have to always be difficult. And, even if it is a bit challenging to make a change…isn’t your happiness worth it? Are You Wishing Your Life Away? What about today? Yes, it is important to think about, feel about, and visualize what you want as I have discussed before, but make sure you are not spending all of your time thinking about what could be. Make sure you focus attention on what you have now and be grateful for it. I speak from experience when I say that life can just pass you by if you spend too much time thinking about “someday”. I have wasted precious time that could have been spent with my children thinking about what could be someday. I used to think, “If I do this now, then someday, we will be much better off financially and then I will have time to spend playing with my kids.” The problem was, I was thinking this everyday and my kids were growing up without the benefit of much playing time with mom. Now I take my time to visualize, say my thanks for what I have and release it to the universe. I am then free to focus on today and what is in front of me–including my children. In conclusion, don’t spend all day wishing. Your life will pass you by and then “someday” when you are old and gray, you will spend your days wishing you had not wished so much. In one’s business there can be those times of doubt. Those times of questioning whether or not it is worth it, whether or not you are going to succeed, whether or not what you have is what people want. Although, according to the Law of Attraction, we want to turn those thoughts of doubt around into positive thoughts and visualize what it is that we want, I think that those short times of doubt do serve a purpose. I know that if I have any doubtful thoughts, I am then more consciously aware of what I am thinking. I make sure I spend some energy turning those thoughts around. My doubtful thoughts bring me to the visualization process and then the gratitude process. I have noticed that since I do this, my thoughts of doubt do not last at long and do not make me feel ill inside. I now spend much more time with my positive thoughts, my visualization, and my thoughts of gratitude. This makes for a much happier me! So, when you have those unsure thoughts, recognize them, embrace them, and then turn them around into positive ones. The effects can be life changing! Everyone seems to have that friend that always wishes for a better life or things to go right. Do you ever catch yourself doing the same things? Maybe you might catch yourself saying “I wish…” or “Things would be better if…”. sometimes it isn’t just our friends that have low self esteem, but even ourselves too. It may not be as huge a problem as others may have but it may be there to some degree and only you know about it. Sometimes a low self esteem or a problem you see with yourself gets in the way of doing something you like. Ever thought about going to the beach but wouldn’t because you thought of what others might say about your body? These things happen, not to just people you see with problems but to those who seem to have it together or maybe even yourself. For most, you might not feel like this is even a problem. But having a low self esteem can bleed over into other areas of your life and potentially hold you back. It can stop you from trying new things that you might actually enjoy had you taken the next step. It might stop you from taking a step into a financial endeavor that may have netted you more money. However you look at it, your self esteem can cause you to be very conservative, sometimes too conservative. Getting over or through these situations requires some self improvement that you can apply to one or all areas in your life you wish to change. The first step is realizing what problems you think you have. Find a close friend that you can talk to about anything. Ask him / her about all those things troubling you. Ask them for their honest opinion and be prepared for some honest criticism in return. The trick is to take their words wisely. Your initial response may be that they’re blowing things out of proportion because you don’t see yourself like that. But that’s just it, you don’t see yourself like that, others do. Now that you see yourself as having a potential problem, how do you go about fixing it? One of the best ways is to find someone who you admire or look up to who has seemed to have gotten past the same problem or hasn’t had it. Next, use that person as a mentor. It is easier to get through something if someone else has done it before. Apply what they have done and use it in your life. A lot of the problems people have some times is changing their beliefs. No, not religious beliefs, but the things you have grown up believing to be true. Usually a belief we have is something we believe in with such conviction you might get angry when someone tries to prove you wrong. You can use a simple technique to change a belief. Associate enough pain to the old belief, or what you wanna change, and apply the thought of overwhelming pleasure to what belief you wish to hold, or what you wish to become or be like. Once you learn to change your beliefs and master the ability to do so, you can begin being a mentor yourself. You can help others that come to you and pass this new skill on down through your children. For those who happen to research more on how to change all aspects of their lives from self esteem to even personal finance, there are plenty of self help books and authors that can help out. There are also a plethora of online sites that help in this field to. I am also happy to help anyone who is looking for a mentor. I try to spend some time each day improving myself in some way. This has helped me become a better wife, mother, friend, daughter, mentor. I look forward to and strive for that betterness. You can too! How to Get Referrals for your PTC,PTR,MLM,HYIP etc.. If you are the owner of Sherrie Shares, or someone who enjoys this blog why not upgrade it to a Featured Listing or Permanent Listing?